Lactobacillus Plantarum 299v is a probiotic strain of Lactic-Acid Bacteria (LAB). As a probiotic, it is a type of “good” bacteria that confers positive health benefits on its host organism. Lactobacillus Plantarum 299v is said to support gastrointestinal health and digestive function. Lactobacillus Plantarum 299v is a specific substrain of the Lactobacillus Plantarum species of probiotic microorganism. This substrain is considered to be particularly effective at colonizing the walls of the intestines and reducing symptoms of conditions such as irritable bowel syndrome (IBS). In research studies, it has been found to reduce inflammatory markers, regulate the growth of pathogenic “bad” bacteria and to improve the efficacy of vaccines when supplemented after administration. There are over 125 species of Lactobacillus probiotic organisms. 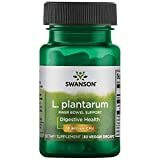 Of these, Lactobacillus Plantarum 299v or Lp 299v is considered one of the best to use in oral supplements. It has good survivability in the low-pH environment of the stomach and has high adhesion to the walls of the intestines. Lactobacillus Plantarum 299v is a species of probiotic bacteria that has been found naturally occurring in the gut. It is found in several fermented foods, such as yogurt, sauerkraut, and cheese. Lp 299v has a good tolerance for stomach and bile acid so it is still viable when reaching the gut. For this reason, it can be used in a probiotic supplement to “seed” the gut with good bacteria and out-compete the bad bacteria. There are a number of different factors that can cause the biome in the human gut to fall out of balance and increase the ratio of bad bacteria to good bacteria. The use of probiotics is said to help restore this balance and promote overall health. This probiotic helps increase the production of mucin which provides the mucosal binding of pathogens for their removal. This process along with increasing the healthy probiotic ratio improves the immune system and inhibits the colonization of bad bacteria. In the treatment of IBS Lactobacillus Plantarum 299v helps to reduce associated bloating and intestinal gas. This probiotic also helps to reduce abdominal pain and inhibits the colonization of EPEC (Enteropathogenic E. coli) which may also cause cramps and diarrhea. Lactobacillus Plantarum 299v also increases the production of SCFAs (short chain fatty acids) which lowers the colon luminal pH and has a protective effect on the distal colon. This action also creates an adverse environment for the growth of pathogens and helps to curb the over stimulation of the immune response that causes inflammation. In addition, Lactobacillus Plantarum 299v regulates the frequency and volume of stools which prevents constipation and diarrhea as well. A clinical study in the World Journal of Gastroenterology published in August 2012 showed treatment with Lactobacillus plantarum 299v (L. plantarum 299v) (DSM 9843) provided IBS symptom relief for those patients with the Rome III Criteria. Two or more of the criteria symptoms that have lasted for at least six months are needed for this classification. One is the pain being relieved by having a bowel movement. Two is the onset of pain that is related to the frequency of the stool. The other symptom is changes from the appearance of the stool when pain is experienced. For IBD (Inflammatory Bowel Disease) a clinical study showed taking Lactobacillus Plantarum 299v helped increase the secretion of anti-inflammatory cytokines Interleukin-10 (IL-10). This supplement also reduced the secretion of Interleukin 12 (IL-12) and Interferon gamma (IFN-y). These are pro-inflammatory cytokines associated with IBD. This probiotic treatment also inhibits translocation of harmful endotoxins and bacterial pathogens from crossing the mucosal layers in the intestines to outside the Gastrointestinal Tract. In IBD patients the regulating mechanism that controls inflammation is overwhelmed. This may be caused by a disorder in the normal mucosal immune mechanism. Symptoms of this condition include abdominal pain, bloody stools and diarrhea and weight loss. A clinical study to be published in the December 2015 British Journal of Nutrition showed Lactobacillus plantarum 299v increases iron absorption in young women when using an iron-fortified drink with this probiotic. Iron deficiency is a common problem in young women. The study concluded that the intake of probiotics increases iron absorption by about 50 %. Some common symptoms for iron deficiency (anemia) include a lack of energy and feeling tired. Headaches, tinnitus, itchiness, hair loss, a sore or smooth tongue and things tasting different may occur. A clinical study published the European Journal of Gastroenterology and Hepatology in December 2013 showed that treatment with Lactobacillus Plantarum 299v modulated the gut barrier function in people with obstructive jaundice. This probiotic treatment improved the intestinal permeability after biliary drainage and inhibited the inflammatory response. There are few reported Lp 299v side effects in clinical trials. This supplement is generally considered to be safe when used appropriately. However, the use of probiotics may not be recommended for certain individuals. Probiotics should not be taken by those with impaired immune systems such as those with organ transplants or who are on immune suppressant medication. People with SBS (short bowel syndrome) should not take probiotics as well as those using a catheter. Anyone with open surgical wounds should also avoid probiotics. Unless otherwise directed by a medical professional, probiotics should not be taken while pregnant or breastfeeding. Lactobacillus Plantarum 299v is beneficial for those with IBS and IBD and for nutrient absorption. This strain of probiotic bacteria has been well studied for its benefits and side effects. Speak to your doctor before deciding to use this supplement to make sure it is right for you. Hoppe M, Probiotic strain Lactobacillus plantarum 299v increases iron absorption from 2 an iron-supplemented fruit drink: a double-isotope cross-over single-blind 3 study in women of reproductive age - ERRATUM. Br J Nutr 2015 Dec;114(11):1948. doi: 10.1017/S0007114515004250. Epub 2015 Oct 15. Jones, C, Modulation of gut barrier function in patients with obstructive jaundice using probiotic LP299v. Eur J Gastroenterol Hepatol 2013 Dec;25(12):1424-30. doi:10.1097/MEG.0b013e328363e26e. Ducrotté P, Clinical trial: Lactobacillus plantarum 299v (DSM 9843) improves symptoms of irritable bowel syndrome. World j Gastroenterol 2012 Aug 14;18(30):4012-8. doi: 10.3748/wjg.v18.i30.4012. Klarin B, Lactobacillus plantarum 299v reduces colonisation of Clostridium difficile in critically ill patients treated with antibiotics. Acta Anaesthesiol Scand 2008 Sep;52(8):1096-102. doi: 10.1111/j.1399-6576.2008.01748.x. Hulst M, Oral administration of Lactobacillus plantarum 299v modulates gene expression in the ileum of pigs: prediction of crosstalk between intestinal immune cells and sub-mucosal adipocytes. Genes Nutr 2015 May;10(3):461. doi: 10.1007/s12263-015-0461-7. Epub 2015 Apr 11. Saad N, Lactobacillus plantarum 299v surface-bound GAPDH: a new insight into enzyme cell walls location. J Microbiol Biotechnol 2009 Dec;19(12):1635-43.